FFS , look at what Adelaide did on the weekend. Imagine all the bedwetting if it was one of the big 4 missing though injury. Miles should have come in if that's the case and Menadue. PREMIERSHIP duo Nick Vlastuin and Josh Caddy will miss Tuesday night's Anzac Day Eve clash against Melbourne after failing to train on Monday. 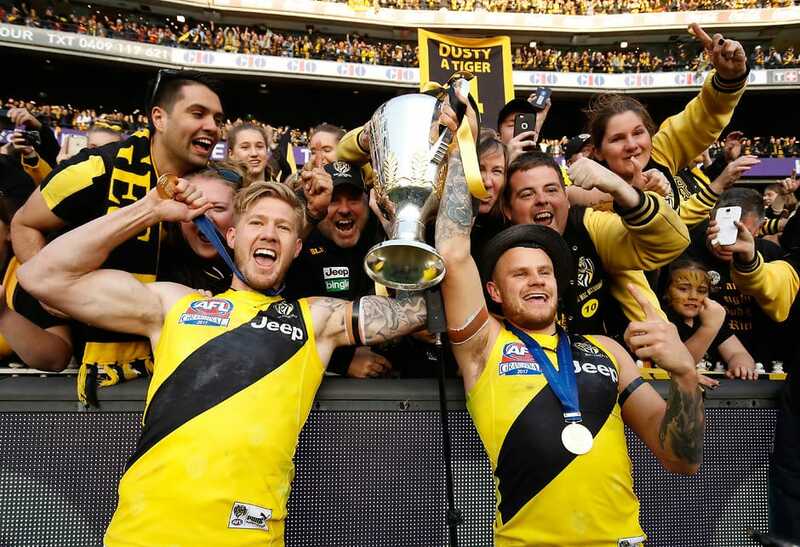 The Tigers will make at least three changes for the blockbuster at the MCG with Nathan Broad almost a certainty to face the Demons in what will be his first AFL game since last year's Grand Final triumph. Vlastuin and Caddy were notable absentees at Punt Road while Broad – who was suspended by the club for the opening three rounds - trained strongly after being left out of the Tigers' VFL team that defeated the Casey Demons on Sunday. The Tigers will lose at least three premiership players for the game given youngster Jack Graham is serving a one-match suspension. "Unfortunately, Nick and Josh won't make it for the game; they're a little bit short at the moment," coach Damien Hardwick said on Monday. "We've got some replacements ready to go for those boys. "It's disappointing but that's the nature of our game. You lose a couple and you bring a couple in. "We've got some players who have been in great form in the VFL. While it's disappointing to lose Jack, we're happy with the replacements we're going to bring in." It is believed Vlastuin, who was scheduled to play his 100th game this week, has a calf issue that stems back to the Tigers' big win over Brisbane nine days ago. Mystery surrounds Caddy's absence from the half-hour session. The former Cat had 16 touches against the Lions after returning from a one-week suspension. Sam Lloyd and Jack Higgins were also part of the squad of 22 that trained on Monday after sitting out the club's VFL win. Higgins looks set to play his second AFL game after his exuberant debut in round three. The big stage (an 87,000-plus crowd is predicted) is sure to suit Higgins' temperament. "He's one of those players, isn't he?" Hardwick said. "He takes great delight in everything he does at the footy club and he'll be one of those players who'll certainly be in contention this afternoon when we have match committee." Very poor decision to leave Miles out of the team. "We've got some players who have been in great form in the VFL." The player in best form in the VFL for the past weeks has been Miles. Looks like he's got another favourite in Higgins. 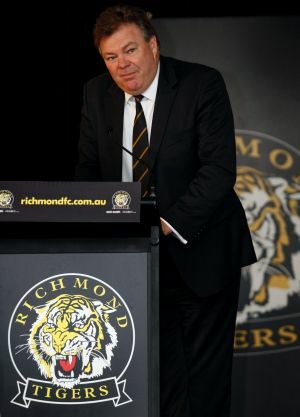 Miles must be kicking himself for believing the LIES he must have been told by Balme to stay as he would get a chance at Richmond. Caddy and Prestia and Graham and Rioli have been out and still they go back to Lloyd and Higgins rather than Miles. Such a dog act to destroy a player's career. It's not as if Miles hasn't been showing he deserves a chance. He's been consistently the best player in the VFL for the past eighteen months. geezus Redan, thats bloody poor form. If you want to know why snipper doesnt get a game , go & watch VFL & you will see. Actually, i have just read your rubbish(derogatory comment deleted ) why dont we have an ignore function ? If we lose to Melbourne it will be because of the midfield. To lose two hard nuts in Caddy and Graham (and Dusty just going, for him) and replace them with Lloyd and Higgins is not just stupid but totally arrogant. If we lose it will be solely down to Hardwick. Then I'll be wrong and our midfield will have stood up big time. Actually, i have just read your rubbish & you are a dead set effwit, why dont we have an ignore function ? Miles was at his ‘ball-magnet’ best, racking up 35 disposals (21 contested possessions, 11 clearances), Best – Richmond: Miles, Soldo, Baker, Ballard, Wood, Bolton, Markov, Menadue. Anthony Miles, in customary fashion, accumulated the ball at will, and was at his reliable best in front of goal. To your last point, we do have an ignore function. Go to your account "Profile", "Settings" "Modify Profile", "Buddies/Ignore List"
There are also posting guidelines on the first page. "4. Personal Attacks: We appreciate that people have different opinions and we encourage people to share their views. However, publicly ridiculing or attacking someone’s character because they do not agree with your view and because they post a view that opposes yours cannot and will not be allowed. Posts of this nature will be removed and the poster warned."